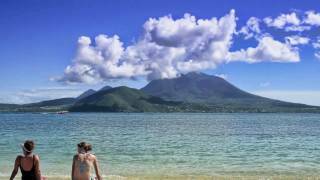 Saint Kitts and Nevis with its capital Basseterre is located in North America (Caribbean, islands in the Caribbean Sea). It covers some 262 square kilometers (1.5 times the size of Washington, DC) with 52,715 citizens. English is the language commonly spoken used by the people in Saint Kitts and Nevis. This country shares no land borders with another country. Saint Kitts and Nevis are a pair of tropical islands in the Caribbean, about one-third of the way from Puerto Rico to Trinidad and Tobago. What is really remarkable on St-Kitts and Nevis is the natural aspect. Many tropical birds which one rarely finds elsewhere are present in great concentration in the nature and there are also the famous monkeys which, it is said, were introduced by the pirates. An all-new road permits going to the southeast end of St-Kitts (Turtle Beach) where one feels that a certain febrility in the air will make of this part of the island an appreciated place. To reach someone Saint Kitts and Nevis dial +1-869 prior to a number. The local cellular networks are operated on 850 MHz, 900 MHz, 1800 MHz, 1900 MHz, 3G, 4G. Websites typically end with the top level domain ".kn". If you want to bring electric appliances (e.g. battery chaarger), keep in min the local 230 V - 60 Hz (plugs: D, G). The sign for the locally used currency Dollar is XCD. 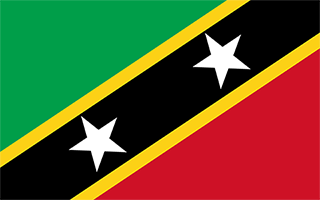 Divided diagonally from the lower hoist side by a broad black band bearing two white, five-pointed stars; the black band is edged in yellow; the upper triangle is green, the lower triangle is red; green signifies the island's fertility, red symbolizes the struggles of the people from slavery, yellow denotes year-round sunshine, and black represents the African heritage of the people; the white stars stand for the islands of Saint Kitts and Nevis, but can also express hope and liberty, or independence and optimism.